The main goal of the Master of Science (MSc.) Healthcare Simulation and Patient Safety is to prepare the learner to deliver healthcare simulation, run a healthcare simulation centre, and carry out research on or using healthcare simulation. 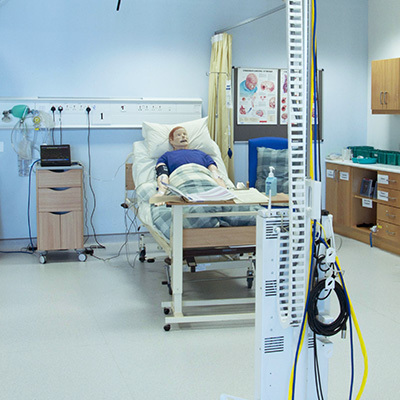 The main goal of the Postgraduate Diploma in Healthcare Simulation and Patient Safety is to prepare the learner to run a simulation centre and use simulation for research, improving patient safety, testing equipment and processes, and integrating simulation into institutional healthcare training, education and delivery systems. The Postgraduate Diploma and Masters programmes are coordinated by Dr. Paul O’Connor and Dr. Dara Byrne of the College of Medicine, Nursing and Health Sciences at NUI Galway. Both have considerable experience in designing, delivering and evaluating simulation programmes in healthcare and other high risk professions such as aviation and the military. Both deliver simulation based programmes to undergraduate and postgraduate learners and inter-professional teams. The postgraduate programmes are delivered online via distance learning. This delivery method allows students to study at a time that is convenient to them, no matter where they live. The modules are delivered using a combination of multi-media presentations, online discussion boards and online tutorials. Students choosing to study the Diploma or Masters in Healthcare Simulation and Patient Safety will be required to attend two interactive simulation immersion weekends scheduled 05th/06th October 2018 and 16th/17th November 2018 with intensive hands-on training using a range of simulation techniques and equipment. These sim immersion weekends cover high fidelity simulation, task training, standardized patients, scenario generation, creation of virtual patient scenarios for e-learning and serious game design. They take place in the simulation centre located at the Irish Centre for Applied Patient Safety and Simulation (ICAPSS) at Galway University Hospital, Galway, Ireland. Healthcare Simulation is gaining traction in Ireland and internationally. In undergraduate programmes – it has become increasingly popular to use standardised patients (trained actors as patients) to assess healthcare students in Objective Structured Clinical Evaluations (OSCEs). More complex simulation exercises may rely on computerised manikins that perform many human functions realistically in a simulated environment. This form of simulation is being used by postgraduate training bodies beyond anaesthetics and emergency medicine now. Training clinicians to the level of mastery in procedural skills is being used in many specialties beyond surgery and task training simulators are evolving and becoming more realistic and complex. Increasingly, virtual patient simulation is also being used whereby learners can use a desktop computer/mobile device to interact with simulated patients or practice decision making. Serious games and games for health are rapidly growing areas of healthcare simulation, and understanding their uses and the key development steps is becoming increasingly important for today’s healthcare educators. Practicing in a simulated environment allows healthcare professionals to perfect and focus exclusively on improving both their technical and nontechnical skills is a safe learning-focused environment.